The news that Microsoft is plans to bring foldable and dual-screen devices to market, and is developing software for them, was first reported by The Verge. Twitter sleuths also uncovered hints in Windows 10 codethat suggest the company already has a whole team in place for the project. But what could Microsoft be planning for these devices? The company has developed two-in-one devices in the past; the Microsoft Surfaceis a currently painted as a laptop-tablet hybrid, plus its reportedly working on a secretive dual-screen devicewith Intel. ​Microsoft’s Andromeda project has the potential to become an all-in-one screen that users could turn into a laptop, tablet, smartphone, and a wearable. Patented blueprintsof the device were unearthed and sell it as being the only screen you’ll need, but as the figure shows the two-display approach is not seamless and would represent a step back from the new foldable displays. Dell taking its concept from sees Microsoft’s dual-screen laptop but raises it another two displays. Dell is working on another laptop with multiple screens, but this concept is looking to push things even further by utilizing three or four displays to make for an even greater level of flexibility compared to today’s 2-in-1s. 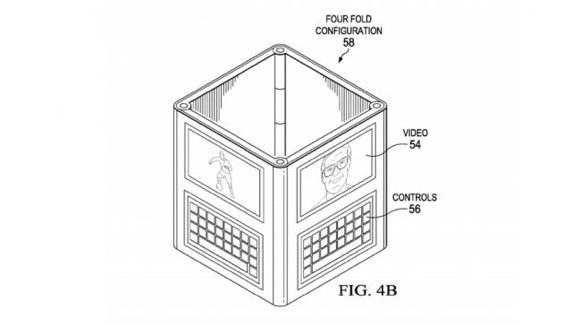 The idea, as outlined in a patentpublished last July is for a device, which has an OLED display, stretched across multiple ‘housing portions’ all of which are connected by hinges. Dell floats the idea of having three or four housing portions, to allow for the device to be folded into several configurations. The patent describes having a planar tablet orientation – with all the displays flat, to make for a large tablet – and a clamshell orientation, or a standard laptop format. In the case of the device having three display sections, the latter will mean one section is folded under the base so you get a traditional notebook form factor. ​Or it could have all three sections upright and folded into a triangle to facilitate videoconferencing for multiple users, with each display showing its own video. And indeed in the case of a four-display device, that could be stood up in a square four-fold configuration (as illustrated above). As is often the case with these multi-screen device concepts, Dell also describes the interface being tied to the hardware, so the device can automatically detect when it is reoriented from, say, tablet to laptop mode, and adjust its interface to suit, by displaying a virtual keyboard and/or touchpad on the base section. Dell seems to have modified its anti-R&D posture and has a number of other similar ideas in the pipeline. Given the recent reports that Microsoft, Intel, Dell and Lenovo are working on these 2-in-1 devices, a new market for folded OLEDs could be “unfolding”.